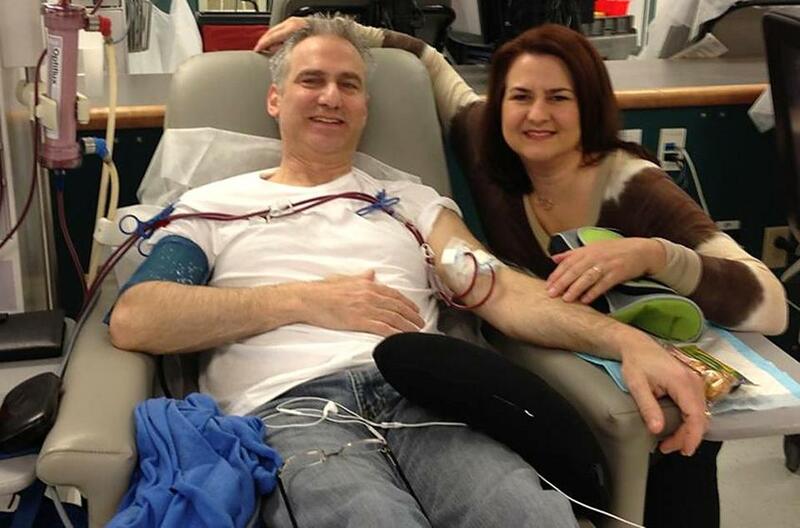 Donor Kelly Wright of California and Eddie Beatrice of North Reading bonded instantly. A North Reading man who nearly died from a bacterial infection he acquired during routine surgery is now scheduled for a life-saving kidney transplant after finding an organ donor from across the country on Facebook. On a Friday in October 2011, Eddie Beatrice had a straightforward surgical procedure to repair his rotator cuff. But by that Monday night, Beatrice was crumpled on the floor of his home, seizing and barely able to move. A bacterial infection had sent Beatrice into septic shock, shutting down both his kidneys and making his blood pressure plummet. Beatrice was eventually transferred to Massachusetts General Hospital, where he spent a week in a medically induced coma and months of inpatient care. He emerged from the crisis but his kidneys had been irreparably damaged, and he remains in end-stage renal failure, undergoing 12 hours of dialysis every week. Beatrice’s sisters wanted to donate a kidney, but were medically disqualified during screening. That meant an agonizing months- or years-long wait on a transplant list. On Jan. 1, a frustrated Beatrice decided the new year called for a new, more proactive approach, and he turned to Face­book for help. Beatrice stumbled on a page run by the Living Kidney Donor Network, and saw a posting just hours old by a woman from California who said she wanted to donate a kidney. He sent the woman, 44-year-old Newport Beach resident Kelly Wright, a message explaining his circumstances. Wright replied 10 minutes later. A flurry of communication ensued and by the next afternoon Wright was calling Mass. General to begin the screening process. She passed; their surgeries have been scheduled for April 2. Wright had previously considered donating a kidney to the son of an acquaintance, but could not get the necessary time off from family and work. However, her impulse to donate remained. Both Wright and Beatrice say the bond between them was instant. The two talk every day. Wright said any hesitations she had melted away after meeting Beatrice’s wife, children, and friends. “As I got to know him and started talking to his friends and family, I just felt compelled to help him,” she said. Wright says her experience as an adopted child who has adopted children herself has given her an open perspective on family. The two have common interests. For example, Beatrice is a diehard Bruins fan who turned Wright, an accomplished triathlete, onto hockey. While remarkable, connections like the one between Beatrice and Wright are increasingly common, said Harvey Mysel, founder and president of the Living Kidney Donor Network, which helps pair donors and recipients. With waiting lists for deceased donor kidneys in major metro areas stretching to 10 years and beyond, patients are increasingly waging publicity campaigns on social media to drum up living donors, Mysel said. While her family has been supportive, some friends found it hard to understand Wright’s decision to donate her kidney, she said. The improbable connection has inspired an outpouring of support among Beatrice’s circle. When Wright came to visit early this month, she was mobbed by dozens of Beatrice’s grateful friends and family members who showed up for a dinner at the Great American Tavern in North Reading. “It really opens up your eyes to know that there are good people in the world who would do something so selfless,” Beatrice said. “It makes me think, I went through hell, but things happen for a reason. Dan Adams can be reached at dadams@globe.com. Find him on Twitter at @Dan­ielAdams86.